Who didn’t love those 25 cent massive gumballs that could be found seemingly everywhere growing up? The work and detail that has gone into this costume makes it look like a replica of the real machines. It’ll bring out the child in everyone and will surely make you feel a bit nostalgic! 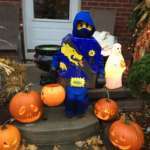 My Grandson is wearing this costume and he also helped me make it. 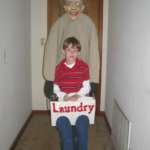 I like to make costumes for my Grandchildren and myself to wear each Halloween. 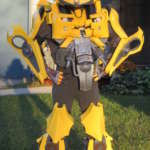 I get a lot of inspiration for my homemade costumes by thinking of what would be cool to make and then searching for ideas online on how to make what I hope to make. 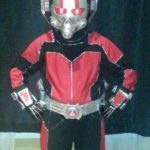 I see many ideas on how to make a certain costume and I use some of those ideas and add some of my own to complete the costume I make. 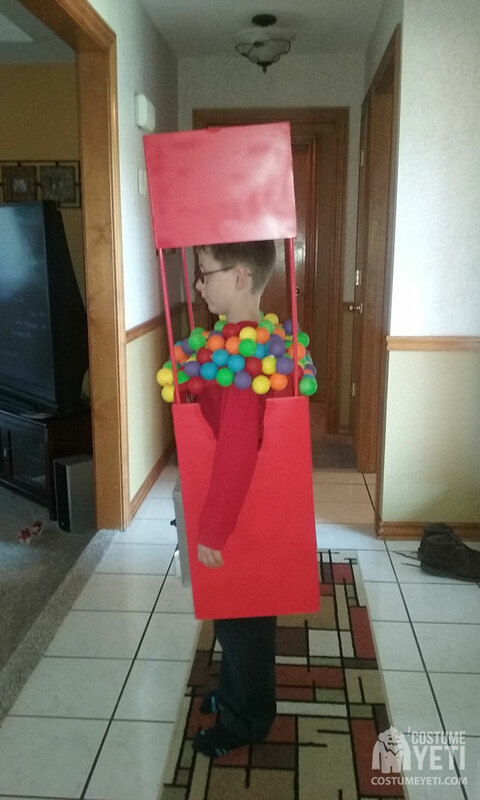 For this gumball machine costume I made my own boxes from white foam board. I cut out four pieces of foam board matching the size I wanted the box to be and I hot glued all for pieces together. The boxes only have front, back, and sides to them. Then I spray painted the boxes the color I wanted to use. 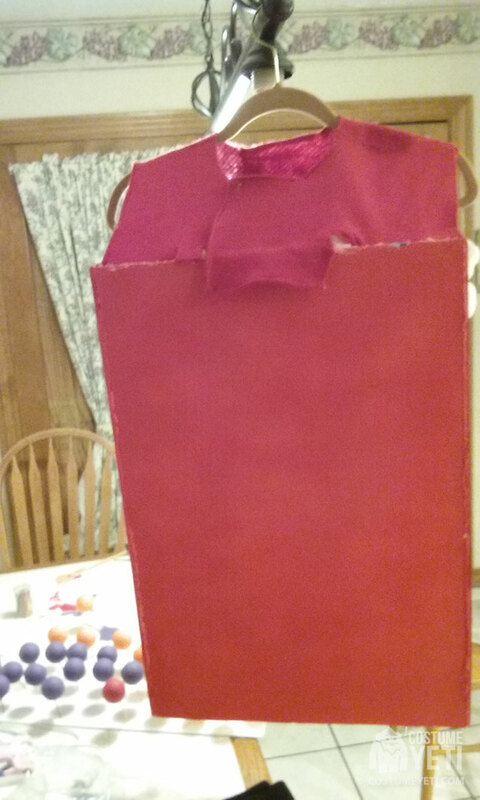 For the larger box that will go over my Grandson’s body, I glued red felt to the front of the box and then draped it over to the back of the box as seen in one of my pictures. A hole needs to be cut out in the felt big enough for your head to fit through. I purchased foam golf balls and my Grandson helped me paint them different colors so we could use them to look like gumballs. Next, we glued all the foam balls to the felt. Hot glue did not keep them secure, and I needed to use a strong craft glue. The one I used was called ” UTIMATE” I found this glue at a local craft store. 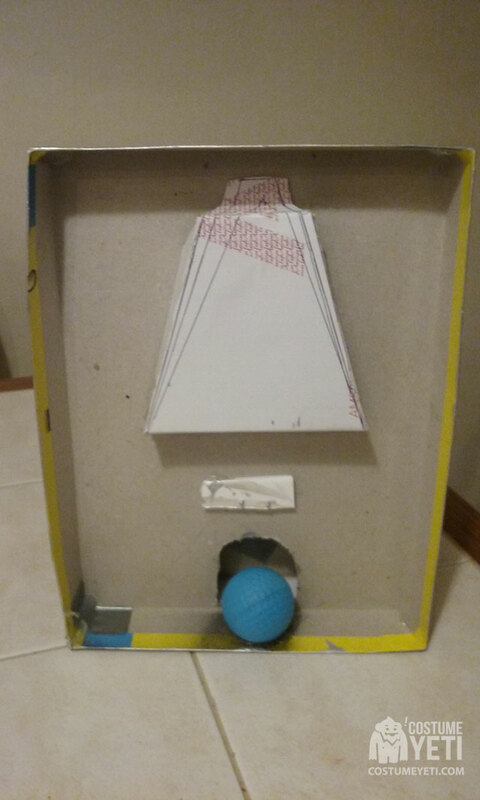 I wanted to make a front piece that had a coin slot, gumball dispenser, and a turn handle like a real gumball machine would have. I found ideas on line on how I could try and make it and added some of my own ideas with it. I used a box lid from a game I had in the closet as the actual base for this front plate. You can use any size box lid you like depending on the size you want. 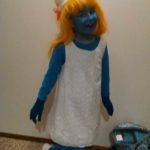 For this costume I used a lid that was 8 inches wide and 10 inches long. I cut out a slot at the top of the box lid for coins to go into. 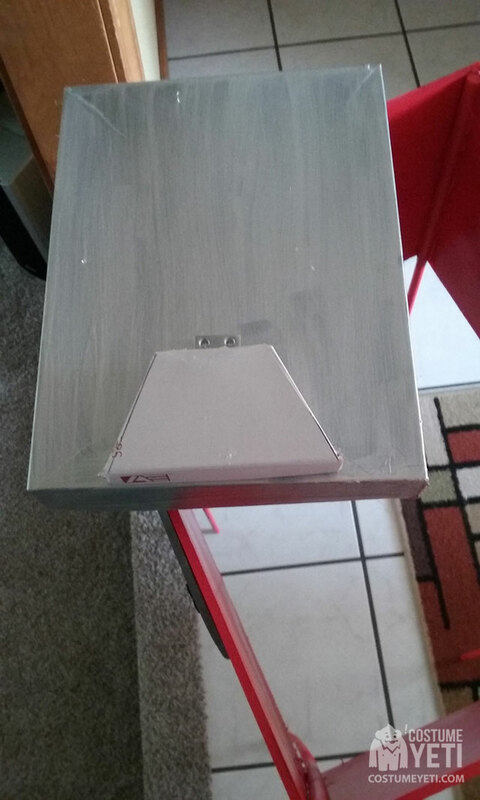 I painted the lid silver. 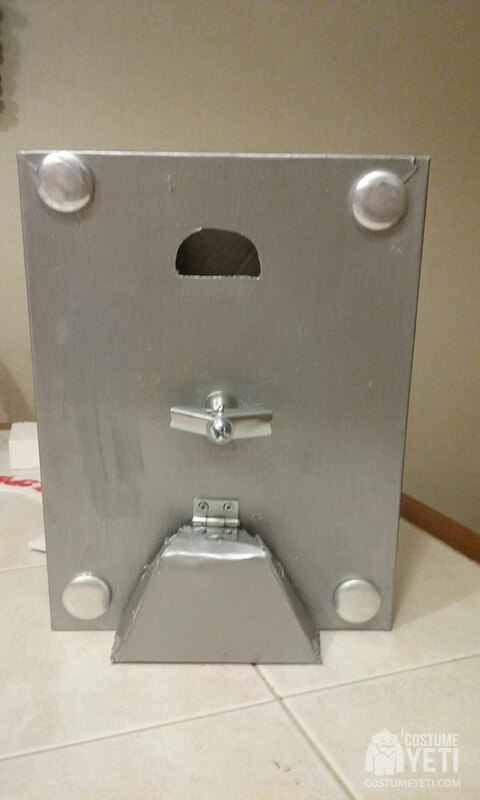 Then I used another box lid that came from a small narrow shoe box lid to make the gumball dispenser part. I had to cut out the shape I wanted and then I used a small metal hinge to screw this piece to the lower part of the game lid I was using as the front plate. This would allow me to open and close the dispenser just like on a real gumball machine. 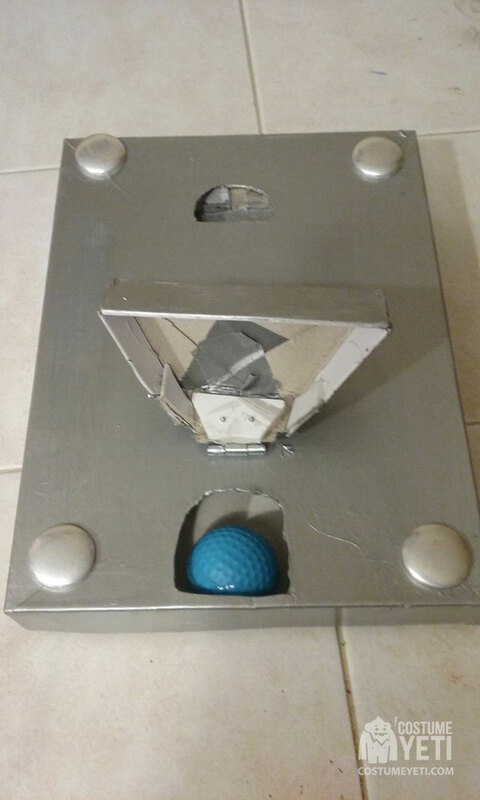 I glued one of the painted foam golf balls to the back of the game lid so that when I lifted the dispenser piece it would look like a gumball had been dispensed. Next I wanted to make a turn handle because everyone knows you put your coin in and then you turn the handle in order for a gumball to dispense. I read some ideas on line and did not like how any of those worked, so I instead purchase a toggle screw and screwed it onto to the game lid. Now, in order to do this I needed to build up the inside of the game lid piece so that it was no longer hollow. You can see what how I did this in the pictures I provided. I just used Styrofoam pieces to do this. Building up the inside of the game lid is also necessary to keep the homemade front plate from caving in. It also is necessary so you have a solid piece to glue onto the front of the large box you use to go over the body. I also made a place on the back of the game lid where coins could actually fall into and stay put if anyone did put a real coin in the coin slot. To do this I just made it out of part of the shoe box and glued it to the back of the game lid. The picture I provided also will show this. I did paint the front of the toggle screw handle black instead of leaving it silver. Next, I hot glued some cover buttons on each front corner of my front plate to make it look like rivets holding the piece in place on the front of a gumball machine. For the price sign, I just cut out foam board and numbers were also cut out from foam board. I painted them the colors I wanted and glued them in place with hot glue. 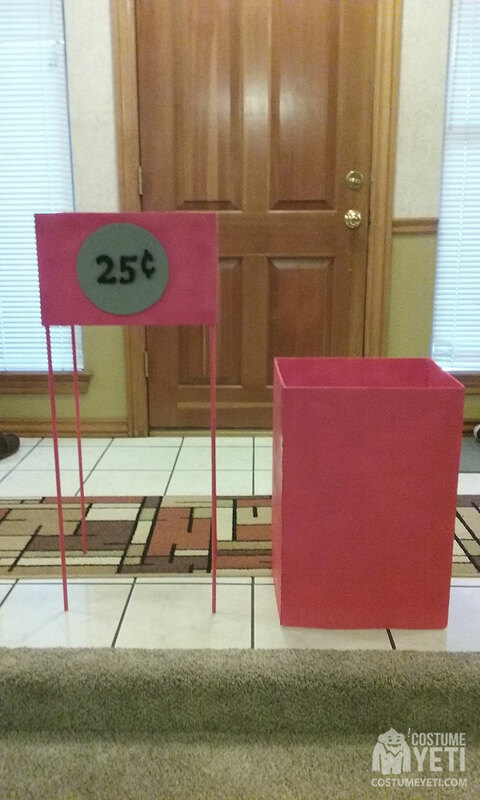 For the small box that is above my Grandsons head I did the same thing for the price sign and then I used 4 wooden dowels that I glued to the inside of each corner. I did not glue these dowels to the inside of the large box. This way I could slip the top off and on easily. 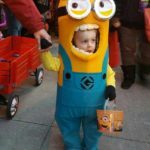 To wear the costume you will need to make suspenders out of elastic and attach them to the front and back of the large box. I glued elastic with hot glue. Then crisscross the elastic that will be the back of the costume before gluing the back part in place. Once you have your suspenders made you put the large box on over the head and allow it to hang from the shoulders by the suspenders you made. Next, you will put the small box on top of the large box and push the dowels down as far into the large box as you want them to go. 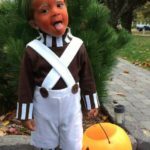 I wanted my Grandsons full face to be seen, so I only pushed down far enough to the top of his head as seen in the pictures. 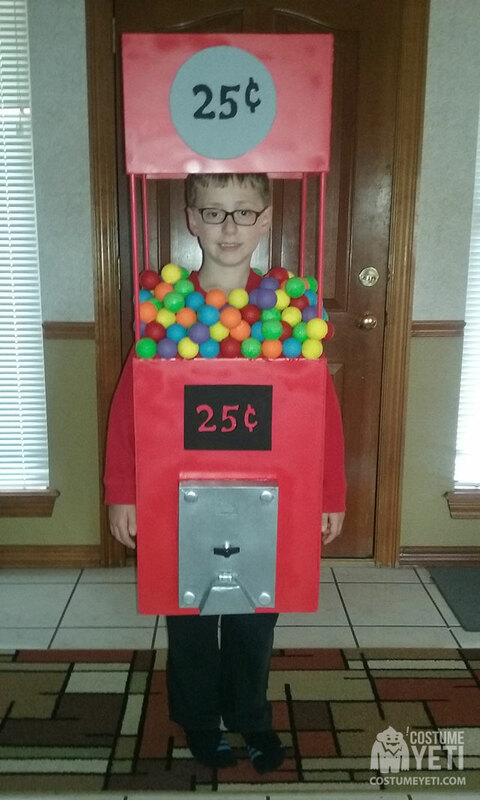 We are very happy how his costume turned out and can’t wait to give out gumballs soon!